The U.S. President Barack Obama called the presumptive president-elect Rodrigo Duterte on Tuesday, May 17, and offered something to him. 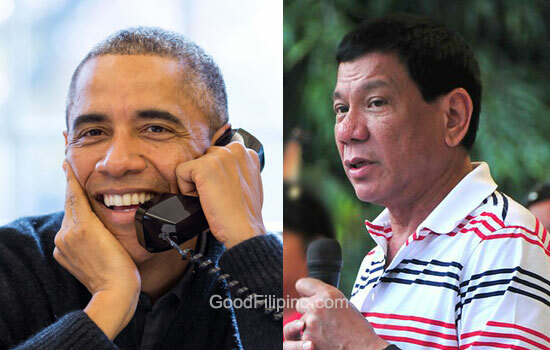 Duterte spoke to Obama via phone. Whitehouse.gov released the statement regarding to the 'call' of the U.S. President. He noted the successful election and record voter participation were emblematic of the Philippines’ vibrant democracy. Obama offered his sincere 'congratulations' to the incoming Philippines President Rodrigo Duterte. He congratulate him on his election win, stressing that their countries' alliance was based on a commitment to human rights and the rule of law, according to Whitehouse. Here's the full-statement from White House. President Obama spoke by phone today with presumptive President-elect Rodrigo Duterte of the Philippines to convey his congratulations. President Obama noted that the successful election and record voter participation were emblematic of the Philippines’ vibrant democracy. The President highlighted the enduring values that underpin our thriving alliance with the Philippines and the longstanding ties between our two peoples, including our shared commitments to democracy, human rights, rule of law, and inclusive economic growth. The two leaders affirmed their interest in seeing the relationship continue to grow on the basis of these shared principles. President Obama "highlighted the enduring values that underpin our thriving alliance ... and the longstanding ties between our two peoples, including our shared commitments to democracy, human rights, rule of law, and inclusive economic growth," White House said. According to Obama's deputy national security adviser, Ben Rhodes, "This is a new government and we’ll want to hear from them directly what their priorities are." "to build on progress made with the last administration," as Rhodes added. What do you think that U.S. President Obama and Philippines President Rody talked about? Please point out your thoughts in the comment section below. Comments or suggestions about "Obama offered something to presumptive president-elect Duterte" is important to us, you may share it by using the comment box below.